Exceptional Keyword research tips to help increase Sales! 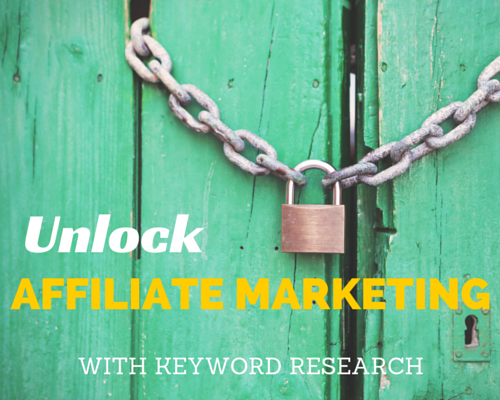 →Exceptional Keyword research tips to help increase Affiliate Sales! Today, we have some actionable keyword research tips from Jake, Brand Manager for Long Tail Pro. He’s an expert in Keyword research and inbound marketing so it’s a huge pleasure to have him share some powerful points with us that are confirmed to help us generate more income with Affiliate Marketing. Jake is not only here to talk about keyword stuff. He’s also got a special gift for you my readers. I’m a firm user of Long Tail Pro so I highly recommend you check it out now that its Brand Manager is here with a special discount. Now, over to you Jake! As a reader of Enstine’s blog, you already know that affiliate marketing is a viable way to make money online. If you aren’t familiar, the idea is that you can recommend products on your website and then get paid a commission based on any sales that you refer for that product. This comes in many different forms, but one of the most commonly used affiliate programs is the Amazon Associates Program. Amazon is the king of online retailers, and they sell just about everything. Being part of their affiliate program means that you could have a website all about toaster ovens and then review your favorite brands, and get paid a commission from Amazon for any sales you generate through your links. This is a short summary of the affiliate process, but today we’re going to focus on the steps you need to take to get to that point. After all, if nobody comes to your website all about toaster ovens, you’re definitely not going to be making any affiliate commissions. Keyword research is the process you can go through to determine if your product or your niche is something that you can rank highly in Google for. There are a couple of reasons that starting with solid keyword research is a logical first step in trying to start making affiliate income. You want to make sure enough people are searching for your item(s). If the product or service you want to be an affiliate of is not popular enough, you may be limiting how much you can make before you’ve even started. Perhaps only 30 people per month are searching for the product in Google.That is a very small pie to start with.Ideally, you want something that is searched thousands of times per month and is something you can compete for (more about analyzing competition later). Ideally, you want to see a lot of advertisers for the product or type of product that you want to sell. The idea here is that the more people who are advertising for that search term, the more products you’ll be able to advertise and be an affiliate of on your website. So you want to make sure there is some “commercial intent” for your topic, so they have associated products to purchase. Clearly in our example, if you did a site that contains everything you need to know about toaster ovens, you could be an affiliate of the ovens themselves as well as some other related products like recipe books and other kitchen accessories. Long tail keywords (The Low Hanging Fruit of SEO) are more specific search queries, which generally get searched less often and in turn, have less competition. Long tail keywords are a great place to start when you want to launch an affiliate marketing business. In the toaster oven example, “toaster ovens” would be a generic, “short tail” keyword that you would have trouble ranking highly in Google for. However, “Best toaster oven under $100” is an example of a long tail keyword that will likely be something you could rank for. The idea is that if you build a page on your website that is titled “Our Best Toaster Ovens Under $100” and then write some in-depth reviews of those products and create a helpful buyers guide, you’ll rank better in Google because you are specifically addressing the question of the searcher. When getting started, I’d suggest using a keyword research tool to find a list of 20 or so long tail keywords that get searched frequently enough (over 1,000 times per month) and have beatable competition. This will give you a great kick start for your affiliate marketing site. Do the results have the keyword in the page title, page description, and URL? What are the metrics like Domain Authority and Page Authority (from Moz)? How many links are pointing to that website and to this page in particular? Once you’ve answered these 3 questions, you’ll have a good idea of how likely you are to break into the top 10 for that keyword. After all, the top 2 results get about 50% of the clicks. Ideally, you’ll find at least a couple of sites in the top 10 that don’t have the exact keyword in the page title or description. This means that those pages probably aren’t truly focused on this keyword. It’s also great to find Domain and Page Authority in the 20’s or even lower, which means that the site isn’t super authoritative. Finally, you’re looking for pages that have very few or even zero backlinks pointing to them. This is still an important indicator for Google’s ranking algorithm, particularly the quality of those links – not the quantity. However, if a page doesn’t have even one link from another site, this is typically a good sign for you! Keyword research is a critical component of your affiliate marketing efforts, so the sooner you start finding the best keywords, the sooner you can start making some money. Long Tail Pro makes the process of finding keywords and analyzing your competition both quick and simple, so you don’t waste valuable time. We’ve set up a deal just for Enstine’s readers that will get you $20 off of Long Tail Pro when you click this link. The offer will only be open for 72 hours, so click here to get the discount. For more information about keyword research and related topics, come visit us at the Long Tail Pro blog. We hope to see you soon! Jake Cain is the Brand Manager for Long Tail Pro and spends his time blogging about all things related to keyword research and inbound marketing. Jake has built several high traffic websites on a variety of topics that were primarily grown through strong keyword research, which is why he’s confident that this stuff works! The goal of the Long Tail Pro blog is to take these inbound marketing concepts and deliver them in a simple, straightforward language that the average person can understand. In his free time, Jake has a wife and has 3 young sons. He spends a lot of time settling arguments, wresting in the toy room, and pitching batting practice in the back yard. Hey Jake thanks for this beautiful post and most especially for the discount you offer my readers 😉 Long Tail Pro is one of the Best Keyword Research tools I’ve seen for Content Marketers and Bloggers. I’m sure they will jump on this offer. I just want to add a little more how this super exciting keyword tool helps me locate long tail keywords that get 1000s of local monthly search. Now, the Apply Filters facility adds huge value to this exceptional keyword and competition analysis tool. It helps save time and takes you straight to what you want. Another very exciting option you discover above is the ability to exclude short keywords. In this example, if the keyword has less than 3 words, the SEO software will automatically remove it from the list. So this desktop SEO tool can help you discover money making long tail keywords in no time. It’s a huge time saver for Internet Marketers and Bloggers. Keyword Research with Long Tail Pro – Simple Case Study. Here is exactly how this keyword research tool can help you discover an interesting hot market. With this, you able able to create niche blogs promoting amazon products and of course, it’s needless to say here that if well done, you will generate sales. Let’s find out what is going on in the Combat Knives niche. That is actually our seed keyword. It’s very simple to go about this in Long Tail Pro. first, let us create a campaign. In this first phase, you already lay a solid foundation for your campaign. Note that the campaign name ‘combat’ does not represent the keywords. That’s just the name I gave the campaign. Note that this desktop keyword tool allows you to enter multiple seed keywords in a single campaign! 138 keywords were found. 133 were filtered out and only 5 long tail keywords were returned. Now, Col Steel Knives got my attention with up to 9900 local searches per month and low competition. Let’s do some competitor analysis by clicking the keyword. This will analyze the entries on Google page #1 for this keywords. Here we have 7 entries that are on page #1 of Google for the chosen keyword. 3 of these entries are targeting the exact keyword as you find it in their titles. Long Tail Pro does not end here. We are still able to analyze further to determine the strength of these competitors but let’s find out from Amazon if there are products to promote. Grab your copy of Long Tail Pro and experience the keyword research process. Play around the options and filters to get more accurate results. This may not be the best though! It’s just a simple case study to spark your brains to what this tool can help you achieve. All you will need is just a seed keyword to begin with. The rest will be developed and delivered to you on a golden plate. Jake has done an awesome job in this post so let me here what you think about it. Share your thoughts in the comment box and don’t fail to grab your discounted copy of Long Tail Pro. You have just 72 hours! Keywords are the important part to write a SEO friendly article. Before writing a content for our blog we need to do keyword research. This is an important post on keyword research. I basically use Google Keyword planner and some other keyword research tool to do keyword researching. I also appreciate the the offer of Long Tail Pro. Thanks so much for sharing this informative post. For now I often use is Google Adword Planner. That is where I do some keyword research. Thanks, you have informed another tool for researching the keyword and how to use it. That’s so interesting. Thanks for having Jake here to explain Long Tail Pro! When having a niche site, this will work like a charm. I’ve dabbled in the past doing something like this, but not with a long tail. No wonder why it didn’t work lol. Jake I want to thank you for this incredible information you have shared here. You covered so much and you are spot on! I do have to recommend this to many of my friends who are doing this kind of marketing. I would hate to see them fail. Sharing your knowledge will surely up their game. Thanks so much for the kind words. Long tail is definitely an equalizer that let’s the “little guy” compete with the big guys – you just have to target the right keywords and actually write really helpful content. The primary benefit of Long Tail Pro is to make easier for bloggers to address the concerns of those internet users who are very specific in defining their problem and also very few people are already serving them. Discount offer is very attractive and I think they offer such huge discount on no any other occasion of season’s festivals. For serious bloggers this tool is must to stay focussed while serving the needs of their blog visitors. Thanks for these keywords rich articles man, you are just doing a great job and I have learnt much from you. Awesome post, you bleeped up my brain with unique strategies so i would like to try them out & i heard its paid product ! Is there any free version for long tail pro or anyother free good alternative ?? If available please replyto my comment & i am currently using Google keyword planner which is damn free forever. Waiting for your reply eagerly. That’s a good question. Long Tail Pro does have a 10 day free trial option, but you’re right that it is a paid tool. There are probably some free ways to piece together your keyword research as you mentioned, Long Tail Pro just saves you a lot of time generating those keywords and analyzing, particularly if you are doing a decent amount of research. Thanks for reading! Thanks for you’re valuable reply 🙂 ! That’s bad Issac and be sure not to have anything near good from your pirated copy. So disgusting to hear you say that to Jake! I am sorry bro, i said i will download cracked version & i forgot that you’re the manager of long tail pro & i am 16 years old blogger. i usually prefer for cracked version ! Sorry if i hurted you. This is a nice post on how we can earn from affiliate marketing. This can easily help us to make a good income from our blog and we can get good traffic . This is a nice software to help us get high traffic to our blog . Thanks for the discount you are giving for buying this software , it will be a of great help. Thanks for sharing about this software and how we can earn good affiliate commission. Keyword tips is the Best thing any Blogger or Marketer needs to keep getting, Long tail pro answers most questions and is one of the greatest solutions for keyword research that will help bloggers/marketers to succeed despite high competition now, I am happy about this review. and Thanks Jake for the comprehensive introduction and how to use LongTail Pro. Thank you for saying that and thank you for reading! I’m grateful for Enstine for allowing me to share with all of you. We tried to use Long Tail Pro using the Trial Mode but the fetching of keyword is too long. I think is not working at all. Is it the Google API issue? Thanks for the comment. If someone is seeing the keyword generator being delayed, it is almost always an issue with the Google integration. The good news is, it’s generally a simple and quick fix. If you’re using it still, please email support@longtailpro.com with the issue and they should be able to help get it straightened out. Thanks! I have tried the trail version of Long Tail Pro software and it really give me success for what will called trial version, but i will purchase the full version for my niche site project in coming weeks. Thank you for sharing this information. It isn’t news that keyword research is important for a blog but it is new for me to know that keyword research especially Long pro is important in affliate marketing. Your steps are easy to follow. I definitely will try this strategy. Thanks for sharing and you Enstine for inviting Jake to shower us with great insight. Your article is small guide for all those who are part of affiliate program. I am making money from Amazon affiliate program and this will definitely help me to improve my business. Jake this is a powerful educating affiliate marketing deep tips coming from,i sure agreed with that long tail keyword is just the juice of any affiliate marketing product that one must compete for in order to rank well in google and to make the money at the end. Thanks for this awesome post. I have been using long tail, but couldn’t get the expected results. After reading the post, I found out some new tips and faults in what I was doing with the tool. It is my first time on your blog and I would like to thank you google that redirect me to you blog. I will read also another posts of you. Now coming to the point Keywords plays a big role in organic traffic. To get organic traffic you need to research good keyword which has good search volume. Thanks to make a light on all these points here. Thanks for following up from Google, reading and dropping a comment. I’m so excited you dropped a feedback. I use long tail pro for all my keyword research, its a very powerful tool to have. Do you know if inside Long Tail Pro they allow you to input your own URL of your site to use as a comparison for the keyword difficulty algorithm? Or is this just a number they calculate from external metrics only? Thanks!